Different from the background music, this is a feature that you can any sound files relatives to the current page contents. For example, while you’re presenting products, you can play some client interview recordings. Or when introducing a song, you can even put it into the page. Now let’s see how to add sound into a page. Step1: Click “Edit Pages”, a new window will show up. Step2: Click “Add sound” button or choose “Insert->insert sound”, then draw an area for the sound bar. 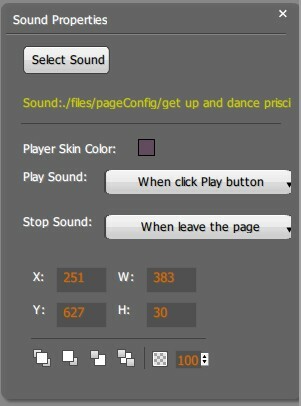 Step3: Look at the right side of the window, a “Sound Properties” window was show, click “Select Sound” to select a sound file from your computer. Then you can customize the player bar skin color, play controls, player size and opacity. 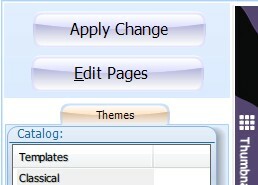 Step4: When finished, click “save” button or “save and exit” button to save and back to the main interface. Apply these changes.